When replacing the windows on your Omaha, Nebraska, home, there are many factors that go into deciding which kind of replacement windows to install. First, there’s the issue of appearance. You want windows that look attractive and complement your home’s architectural aesthetic. You also want windows that are well-built from quality materials and will last for decades. Finally, you want windows with energy-saving qualities to ensure that your home is operating as efficiently as possible. Elite Exteriors offers premium fiberglass windows that check all these boxes and more. 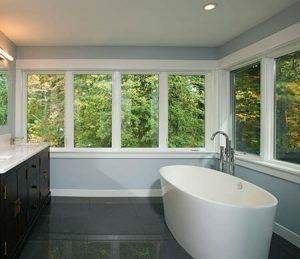 When you partner with Elite Exteriors to have fiberglass windows installed, you can be confident that you’re in good hands. Our factory-trained technicians will leverage their many years of experience to ensure that your new windows are installed correctly the first time and that you are totally satisfied before considering the installation complete. Furthermore, your new windows will be protected by a one-year labor warranty, in addition to a full manufacturer warranty, so you can rest easy, knowing the investment you’ve made in your home is protected. To learn more about the fiberglass windows that we install in Omaha and surrounding areas, contact Elite Exteriors today.